Congratulations to our FasTracKids franchisee Aline Aymes in Guadalajara, Mexico for receiving a plaque in recognition for “10 years of service in empowering children to learn”. 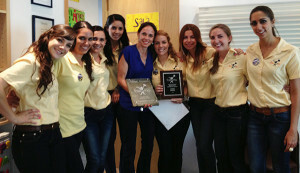 Aline also won the “2012 Top Enrollments – Single Center” award. A big thank you to her and her staff!